Yesterday afternoon, in a small office on the second floor of the Cuyahoga County Courthouse in downtown Cleveland, Ohio, Kat and Carolyn and I finalized our adoption of Rebecca. There were a few witnesses to this: the social worker who has handled our case from the outset, as she did Carolyn’s; the lawyer who made sure all of our paperwork was correct; our friends Gini and Ferrett; and the magistrate who conducted the proceedings. As I did with Carolyn, I’ve avoided mention of Rebecca’s being adopted, though anyone who’s been reading the site for the last several years would probably have inferred it from the fact that Carolyn was adopted. 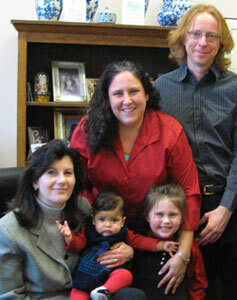 And as with Carolyn, I avoided saying anything because the adoption wasn’t legally final until yesterday. Up to that point, we were borrowing her from the agency, as it were: they were her legal guardians. It was possible at any point for the agency to remove her from our home. In the strictest legal sense, they didn’t even need a reason to do so. Ditto the state. Had we missed one of the six monthly post-placement meetings with our social worker, for example, or even not met the required schedule, custody would have been revoked. Now, of course, that’s no longer possible. Now she is ours as legally as she has been emotionally, now judicially recognized as the part of our family she’s long since become. It was her sister who made it official: the magistrate had Carolyn stamp the legal decrees, so that it was she who made the adoption permanent and binding. Most of the witnesses choked back tears. I felt a few eye-prickles myself, but suppressed them to make sure I got the pictures I hope both girls will cherish as they grow older.